I approach this review not as a poetry expert, a poetry writer, or even (particularly) a poetry reader. 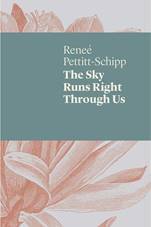 Instead, I come to this review of Reneé Pettitt-Schipp’s book, The Sky Runs Right Through Us, through the eyes of a development practitioner. And perhaps also, an ashamed Australian. This review focuses not on stanzas or pacing, but rather on the experiences to which the reader is unwittingly subjected. Pettitt-Schipp’s poetry – her story – covers her experience as a teacher on Christmas Island and the Cocos (Keeling) Islands, mentoring asylum seekers, then her reintroduction into Australian society and the reverse culture shock that went along with it. You cannot, and you will not, get through this book without being transported to the Islands; to experience the life of both a detainee and an ashamed Australian teacher. You also will not leave this book without feeling as though you have had the experience the author lived herself. It is not for the fainthearted; it is certainly a must-read for the pro-indefinite detention centre preachers. Pettitt-Schipp will take you into the detention centre and then deeper, into the classroom. She describes what it feels like to work with traumatised and grateful people, and perfectly captures the raw emotions that many Australians feel (embarrassed, horrified, sickened). I first met Pettitt-Schipp at the 2017 Poetry on the Move festival, where she read at the National Portrait Gallery as part of panel titled Measures of Expatriation: Poetry and Displacement. I was moved by the stories behind her poems, which she described in detail, and with sorrow. Most of all though, I was floored by her display of thongs-become-art. The thongs, Pettitt-Schipp explained, were used by the students of her classes as material onto which they could write short poems. Thongs, after all, were easy to come by as they often washed up on shore. As an English teacher on the Islands, Pettitt-Schipp was able to engage with creative arts therapy practices to assist her students – the asylum seekers – overcome their trauma. It is this poem, or rather, the teacher behind this poem, that also goes to the heart of Pettitt-Schipp’s book. She is a teacher, and her ability to continue working with traumatised asylum seekers and still record and interrogate her experiences on the Islands is a central and well-executed theme. Each poem is crafted through a dangerous yet alluring mixture of emotions: devastation, love, and wonderment. These poems are, in their own way, each an island of themselves that we can visit, where we can meet asylum seekers whom we all want to help and teach, and simply want to get to know. his scent of cigarettes, spice and sweat. with drums, CDs and a whiteboard marker. This excerpt strongly demonstrates the shame many Australians (and international citizens) feel over Australia’s detention policies, while simultaneously showing the humanity of each asylum seeker. This is the truth that the media and politicians often shy away from. This book – political journalism as much as it is poetry – offers more of an insight into the true damage of the Australian government’s detention policies than any media article I have read; and this, combined with Pettitt-Schipp’s ability to humanise every person she comes into contact with on the Islands, rendered me speechless. Another strong element of the book is that it goes beyond life on the Islands, and into Pettitt-Schipp’s life back home, in Australia. The effect of contrasting her life as a teacher on the Islands teaching asylum seekers, and her life as a human with complex, familiar, and new relationships cannot be understated. Here she compares her life in Australia with the stark reality of that on the Islands; here we meet a person with deep history, tracing memories of her family home and pet axolotls, becoming a new mother and admiring her daughter: swathed in white towel like a pure prophet, and breathing in the righteous life of Australian fauna and flora: the flowers; the honeyeaters, wagtails and mopokes. Without the second half of the book, tracing Pettitt-Schipp’s life back on the mainland, the full effect of her experiences as a teacher of asylum seekers could have been lost. The mainland poems also work as a reminder that life on the Islands was vibrant and exciting, even while it was filled with redundancy, shock, and despair. It is the delicate balance that Pettitt-Schipp has struck with the two halves of her book that makes it so strong, so compelling, so human. Jessica Abramovic is a Communications Specialist and Deakin University student. Her latest work focused on Burmese refugees and psychological recovery through cultural re-enactment, and she volunteers for Girls on Bikes, a free learn-to-ride program for migrant and refugee women.